The Spin: The winning combination of series creator/writer Terence Winter and producer/director Tim Van Patten pick up in season two right where they left off with season one’s superb finale. Opening with a signature Boardwalk montage done to the tune of “After You Get What You Want…” the masterminds behind the show deliver a two-fold message. To the characters, they’re saying, “Watch out, you might get what you ask for.” To the audience they’re saying, “We’re not going to let you down, and you will get what you want and then some this season.” Witness next a Klan shoot-em-up of Chalky White’s booze warehouse. Strung throughout the episode; where we find Nucky trying to balance work/partying with home life/Margaret, Jimmy now married to Angela, and Van Alden’s wife visiting the city for the first time; is one of the show’s most compelling themes: false domesticity and tortured father/son relationships. 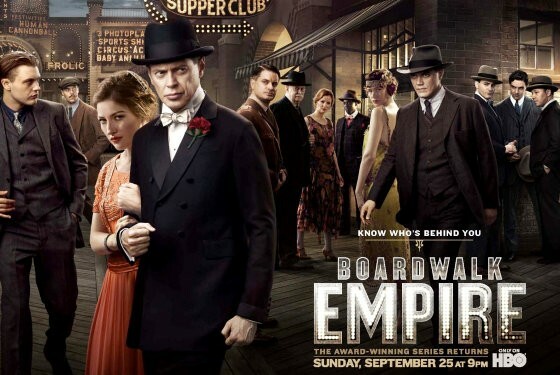 Nucky knows something is up with Jimmy and the Commodore, but it’s his newly strained relationship with Margaret’s young son (apparently there’s no one Nucky won’t try to pay off) and an arrest for election fraud that throw him for the loop. Meanwhile, other more hapless characters long for what Nucky and Jimmy have – seemingly having it all – the family, the luck, the power – but there’s something rotten in Denmark, my friends, and what those poor saps long for is a fantasy about to be riddled by bullets. Beautifully weaving in all of those painstaking period details with self-contained motifs (love the kids watching Chaplin’s The Kid at the end there) while propelling forward the plot and character arcs that will define the season, Winter and Van Patten are setting us up for one doozy of year. My favorite parts: That opening montage, Van Alden “thrilling” the wife by busting up an alcohol-serving restaurant while celebrating their anniversary, and Jimmy literally shoving his feelings in the closet at the end. Wait Until Next Week: Nucky apparently forgot to pay someone off and got himself arrested. Meanwhile, how’s he going to keep Chalky White and the white supremacists happy at the same time? This entry was posted in Boardwalk Empire: Complete Episode Guide, Pop Culture, Television and tagged 21, Atlantic City, Boardwalk Empire, Boardwalk Empire Blow by Blow Episode Guide, HBO, Kelly Macdonald, Michael Pitt, Michael Shannon, Mobsters, Nelson Johnson, Season Two Premiere, Steve Buscemi, Terence Winter, The 1920's. Prohibition, Tim Van Patten, TV Series. Yes I did love film on film w/ Chaplin’s The Kid. Chaplain is engaging with the child, and Nucky is physically (at the theatre) and emotionally absent (last season Nucky sets his home on fire in front the child and this season Nucky hands the kid money to solve behavioral problems). I’m hoping that I get to see this child grow-up with ensuing season. One can only hope the boy can self-correct. But then again, it wouldn’t be compelling television if he didn’t take a dark alley way in Atlantic City the mob. Three cheers to a compelling complex series that is the anti-MTV-Jersey Shore. Last season, Nucky set fire to his childhood home to “burn” away the memories of the cruelty his father inflicted on him as a child (Margaret’s young son was with Nucky and witnessed the act). I think Nucky felt responsible for Margaret’s son getting into trouble at school, playing with matches. I don’t think he was rewarding the “bad” behavior, but rather he was trying to reward the expected “good” behavior after their “talk”. Remember, we know that Margaret’s husband was also cruel to Margaret and the children. And Nucky took care of him! I’m having to watch ‘Boardwalk Empire’ a year late as in the UK it is only shown on a channel I can’t get – anyway, just got the box set of season two and enjoyed this opening episode very much. Just wanted to say that your commentary is great and I’ll be reading through each piece after I watch the episode, as I did with season one (though I probably won’t leave comments on most of them as I’m so late to the party). I hadn’t picked up on the fact that Nucky is paying the kid off until I read your review. In this episode I loved the way all the father/son episodes build up, with so many ironic variations, like the van Aldens who can’t have children (but van Alden is about to be a daddy anyway) and that haunting glimpse of Richard cutting out pictures of happy families for his scrapbook at the end. Judy – I hope those in the States haven’t spoiled what’s to come in this season. Thanks for reading and happy viewing!